When my plane touched down in Los Angeles, I didn’t really know what to expect. I’m new at TechWell and new to the testing community, and sitting on the tarmac, I was just hours away from my first STARWEST conference. By the next day, my nerves had settled, and I already felt like a member of this energetic community. I talked hockey with Prem from SurveyMonkey, David from GLIDR shared his grandma’s pineapple turnover recipe with me, and after the final keynote, Greg from Ramsey Solutions made an effort to find me and welcome me to the community. I’m nontechnical, so I was worried all the STARWEST presentations would fly right over my head. But the conference program balanced technical training, tutorials, and sessions with talks about leadership, effective communication, and people skills that could apply to any field. I took a laundry list of lessons away from the software testing conference that I’ll be able to use in my professional and personal life. 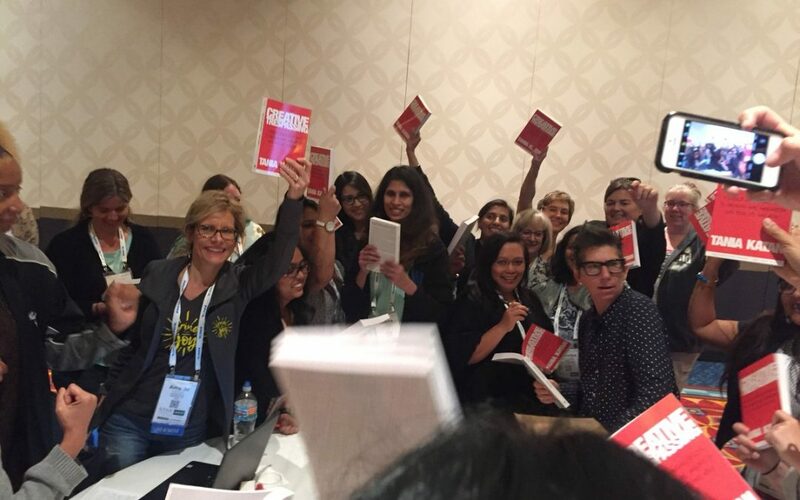 Here are five of the key takeaways from female thought leaders at STARWEST. Jennifer Bonine and Janna Loeffler teamed up for the opening keynote at STARWEST. The pair talked about testing challenges, how testers can write their own stories, and the role relationships play in success and failure. Jennifer and Janna assured the community that manual testing jobs are here to stay. However, human testers need to put an emphasis on more creative test design and architecture and allow AI and test automation to drive repetitive tasks. Following the opening keynote, Jennifer also gave a five-minute lightning talk on mind maps. She discussed how visual tools can help simplify and clarify complex, text-based documentation. We process pictures 30,000 times faster than we process words, so visual mind maps help teams become more efficient and fill gaps in communication. Because Jennifer wasn’t busy enough, she also interviewed 18 thought leaders—including Janna—for the live virtual audience. Janna works at Carnival Corporation, the multibillion-dollar cruise company. She and her team is working diligently on testing the Ocean Medallion program: Basically, when you register for a cruise, you create a profile that is plugged into a medallion and mailed to you. Your medallion is your key to opening doors—literally and figuratively—once you’re on board. You no longer need to worry about tickets, money, or schedules because your Ocean Medallion keeps track of it all, allowing you to simply enjoy your vacation. Takeaway: Stop and think about where your testing story is going and how you play a part in its direction. Dona Sarkar runs Microsoft’s Windows Insider program, which allows users to test prerelease builds of Windows previously only accessible to software developers. The Insiders program has seen so much success because of the community Dona and her team have nurtured. Takeaway: When you open software testing to your community, that community can help transform your product into something actual users will enjoy. When she first started learning how to drive, Isabel Evans was nervous, so her instructor suggested that when things were difficult, she consider this order of operations: Steer in the right direction, adjust your speed, and then shift gears. Of course, Isabel applied this life lesson to testing. First you should make sure you’re going in the right direction and everyone is safe; in software testing, you need to steer toward the correct goal. Once you’re headed in the right direction, you adjust your speed; slow your testing down or even come to a complete stop to make sure you’re on the right path. Once you have your goal and are at a comfortable speed, shift gears; adjust what you’re doing and how you’re doing it. Takeaway: If your testing is becoming difficult, steer toward the right goal, then adjust your speed, then shift what you’re doing and how you’re doing it. I think Tania Katan played hooky on the days her elementary school teachers talked about following the rules. With a background in the performing arts, Tania is creatively disrupting the software industry. She doesn’t play by the rules and encourages out-of-the-box thinking to accomplish goals. There are thousands of ways to get your job done, so don’t fall into patterns like “that’s how we’ve always done things” or “that’s not in my job description.” If you have a creative way to complete a goal, speak up—or follow in Tania’s footsteps and create your own job title and unsanctioned business cards. Takeaway: Your only limits are the limits you place on yourself. The night before Jaimee Newberry’s presentation at Women Who Test, I spent about half an hour forcing the Picture This Clothing Instagram feed on my family. Jaimee’s project captivated me. And it wasn’t just the project itself—although I do start just about all of my conversations nowadays talking about it. What stands out is the leap Jaimee took in order to take more control of her own life. Jaimee’s company lets kids send in their own artwork to have printed on clothing they can wear. She had been sitting on the idea for a few months before acting on it, but once she took the plunge, just a few hours after launch, Picture This Clothing was featured on TechCrunch! It wouldn’t have happened if Jaimee hadn’t taken the risk. Takeaway: The only thing standing between you and everything you have always wanted to do is doing it. This is soo epic ! !